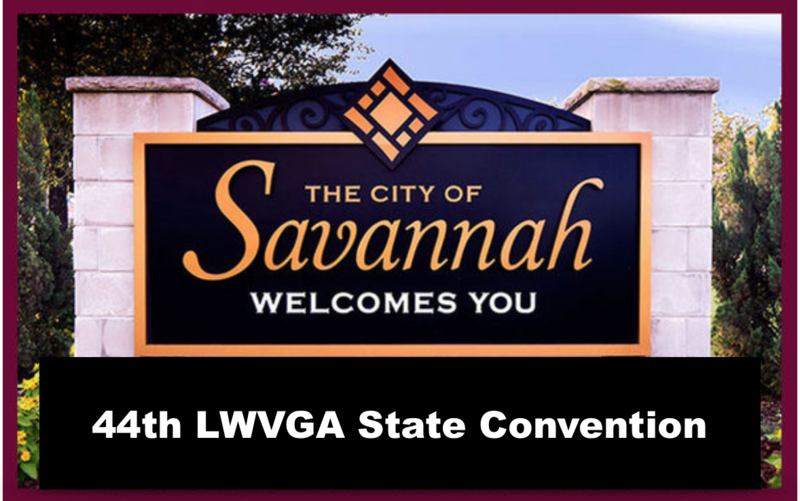 The Hostess City and the League of Women Voters Coastal Georgia is thrilled to welcome you to the 2019 League of Women Voters conference in Savannah. In addition to information packed training sessions and sharing work sessions, Savannah has so much to offer! From house museums, ghost tours, dining, shopping and the beach, we have plenty to keep you busy when you’re not in meetings. We can’t wait to see you – please mark your calendars now for May 2-4. For hotel reservations, please call 912-236-1777 and mention “League of Women Voters"
In preparation please be aware of the guidelines for delegates: Each local League is entitled to one delegate per twenty members of the chapter; Each Member-At-Large (MAL) unit in existence for at least two years and having more than twenty members, is entitled to one delegate; Each MAL unit not entitled to a delegate may send an observer for each twenty members; Each Officer and Director of the League of Women Voters of Georgia are entitled to attend as a delegate; and any member of the League of Women Voters of Georgia from across our state is entitled to attend as a visitor. The last day to book is April 2nd, 2019. The Deadline for Submission of Program Items, Nominations and By-Law Changes is March 2nd!!! Please submit program recommendations for 2019 - 2021 to programs [at] lwvga.org no later than March 2, 2019. Click here for guidelines on Program Planning or here for the Program Planning Response form. Submit recommendations for any by-law changes to bylaws [at] lwvga.org no later than March 2, 2019. Bylaws are found on the LWVGA website. Our nomination chair is Sharon Blackwood. She will be taking nominations from members until March 2, 2019. If you wish to nominate someone, please complete this form and send it via email to nominations [at] lwvga.org.